The Settings	folder allows an Administrator to alter the settings of the portal, and many entities and processes that the platform supports. You can change settings related to Active Directory, the portal, clustering, tags, Twitter, the designers, and many more. To view and change system settings, navigate to the folder System > Settings	, select the setting you wish to change in the folder data panel, and select Edit Setting	from the entity actions menu in the lower right. Alternatively, you can select the Hypertext link from the list of Settings. Navigate to the folder System > Settings	. A list of settings displays in the folder data panel. To edit a setting, highlight it from the list, then select Edit	from the Entity Actions menu in the bottom right. Select Document Settings	, and click Edit Settings	in the entity actions menu in the bottom right of the Studio. Additional options include enabling or disabling the auditing of document interactions. You can also choose how many versions of each document will be kept, set a maximum size for the document repository, and to receive a warning when the repository reaches the maximum size. Click OK	to close the pop-up. Back in the System > Settings	folder, select Portal Settings	, and click Edit Settings	in the entity actions menu in the bottom right of the Studio. The Edit Portal Settings pop-up has a number of customization options, broken out by section. You can choose to automatically lock the screen after a prescribed amount of time, specify the default page to be viewed upon logging in, and even customize your designers. There are also login page settings, notifications settings, and password settings for accounts. The settings are global to all Designer users. In the Portal Settings	section, you can change the appearance and behavior of the portal itself. To close the pop-up after making updates, click OK	.
Back in the System > Settings	folder, select Designer Studio Settings	in the folder data panel, and clickEdit	in the entity actions menu in the bottom right. In the Edit Designer Setting s pop-up, options are available for customizing your designers, including general rules pertaining to every designer. 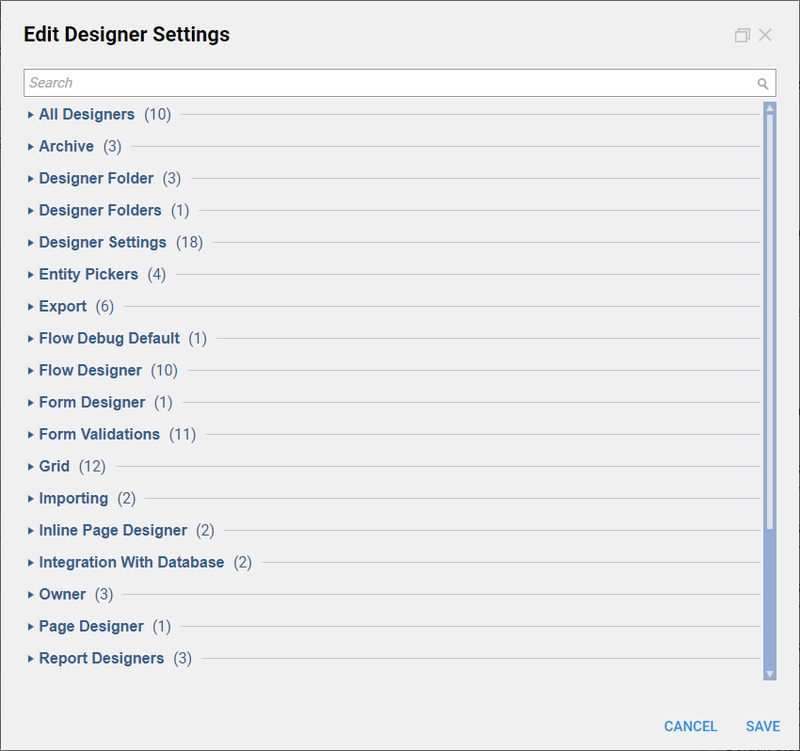 The Designer Studio Settings	section allows you to select the default templates for the various designers. There are also options for importing and exporting items to and from the designers. Each of the designers also has its own section for customizing that particular designer.